Or click the album cover to visit the song and the cd Nervez! - or even buy it. Randy Kloko is the soloist. 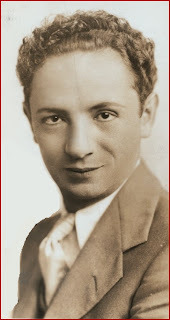 Here's Isaac Feld, the singer. 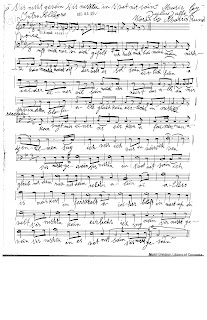 This uber-cynical song, which appears in Zhelonek as recorded by Itzik Feld, was copyrighted by Julius Jaffe and the indefatigable Morris Rund (but the copyright was never renewed). It was supposed to be at the US Copyright Office according to the card catalog, but it was lost for decades. It appears in Heskes but according to the music librarians at the Library of Congress they didn't have it. My friend Sharon Horowitz at the Judaica Collection in the Library of Congress discovered it for me, in a hidden trove offsite at Landover. She believes there is other lost music out there, but she has not been allowed to go on a field trip to find out. Call me what you like, I stand by my belief that there's not a person on the planet who's honest. Every single one wants to be rich, all of you here know it. We all swindle and weasel around the same way, there's nobody honest. If somebody tells me he knows a fine man, a gentleman, I say, "Yeah, right." It never was, it isn't now, and it never will be. I don't believe the rebbe or even the rebbetsin. These days everything is a masquerade, an act, everybody bluffs and deceives the world. There's nobody honest, I say no. It never was, it isn't now, and it never will be. I met up with a friend of mine, he told me his good news. "I got married today, brother," he says, "to quite a woman. She's like a pure queen, and that's what I wanted." "Well, brother," says I, "listen up: you're a big patsy. If this, brother, is your source of pride, that she's a virgin, well, sorry, dear brother..."
It never was, it isn't now, and it never will be. I don't believe the rebbe or the rebbetsin herself. Every girl, if she blushes, then I can swear to you she's a virgin. There never was an honest person, I say no. Honesty? It never was, it isn't now, and it never will be. Mit a bsule an antik.